Built by poet Alexander Pope (and something of an obsession during his later life) is the grotto and tunnel that he had constructed at his property on the banks of the Thames at Twickenham. Pope came to live in what was then the fashionable retreat of Twickenham in 1719 and employed architect James Gibbs to create a small Palladian style villa there, living in it until his death in 1744. He also obtained a licence to tunnel beneath the road known as Cross Deep and leased about five acres of unenclosed land on the other side which he developed as his garden – a project he lavished great attention upon. 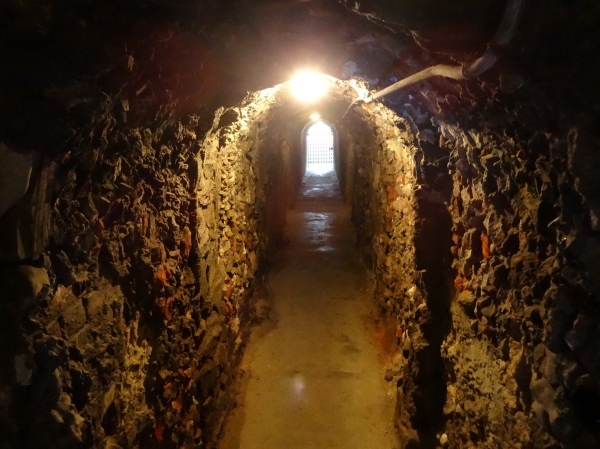 His first grotto was established in the cellars which stood at ground level facing the river and then extended along the tunnel from the rear of the cellars, leading to a misapprehension, promoted by no other than Dr Samuel Johnson, that the grotto lay under the road. Pope, who had apparently been delighted to find a spring in his grotto complex, opened his gardens to the public in 1736. Inspired by what he found when visiting Hotwell Spa at the base of Avon Gorge in 1739, he decided to redesign the grotto as a museum of mineralogy and mining and while much material – including a stalagmite from Wookey Hole in Somerset and hexagonal basalt joints from the Giant’s Causeway in Northern Ireland (the latter a gift, apparently, from Sir Hans Sloane) – was put into the walls, the grotto was never completed. The grotto and tunnel is now all that remains of the villa Pope built which was demolished in 1808. What survives of it is located within the grounds of Radnor House School. The grotto is generally open only briefly during the year including during the Twickenham Festival. An effort continues to have the grotto restored and public access increased. For more details on the restoration project and when the grotto can be visited, see www.popesgrotto.org.uk.